Centuries old cultural heritage has taken on new meaning here, because a group of committed and enthusiastic people has collectively taken responsibility for it. 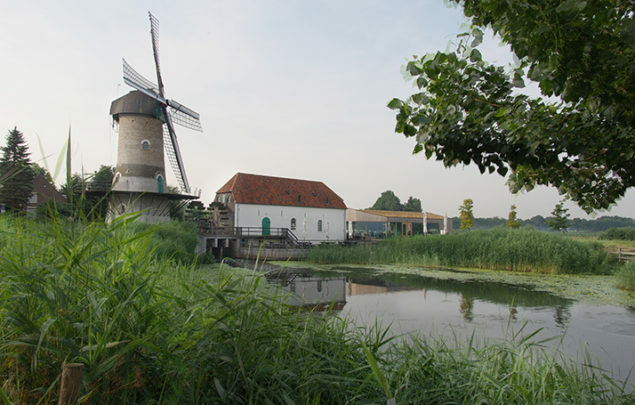 After a thorough restoration of the windmill and the watermill in 2008, a temporary visitors centre was set up. Because of the large number of visitors, it soon became apparent that a new visitors centre was necessary. 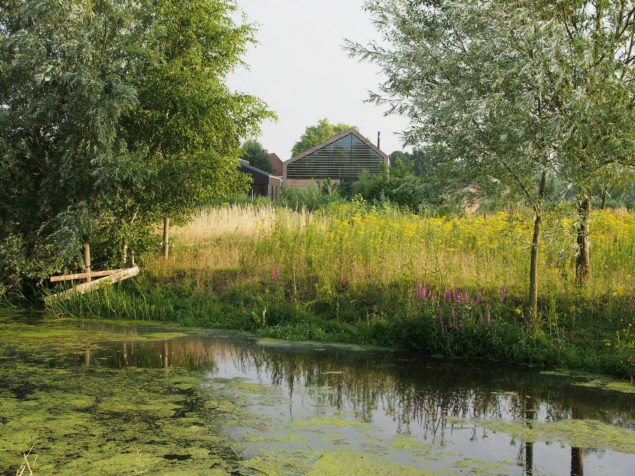 However, new development in an area designated as an ecological zone in the valley of the Aa, is a socially sensitive issue, which demanding a building plan to which all parties can agree as being both necessary and attractive. 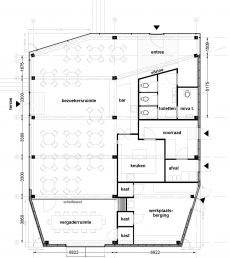 In 2001 SODA+ (collaboration between the architects Gabri Klarenbeek and Hagen Zeisberg, and Jorrit Noyons and Ronald Buïel of Soda) won the design competition to build according to these demands. The brief: build a new visitors centre and a house for the miller. We opted to blend both structures, as much as possible, into the surrounding landscape. We also took into account the location's history and the identity of the organization/residents. 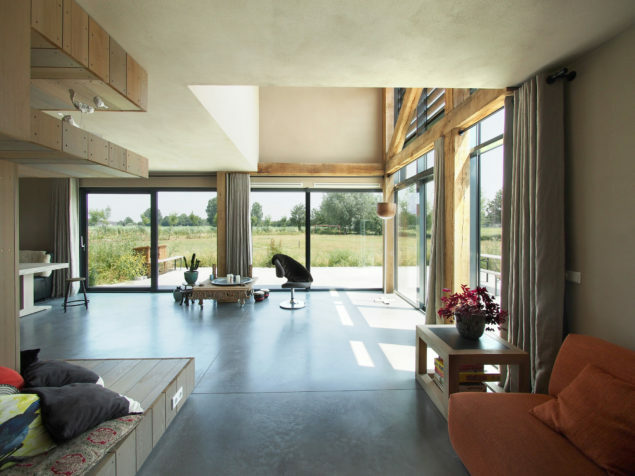 A further consideration was the desire to build in a social and ecologically durable manner. 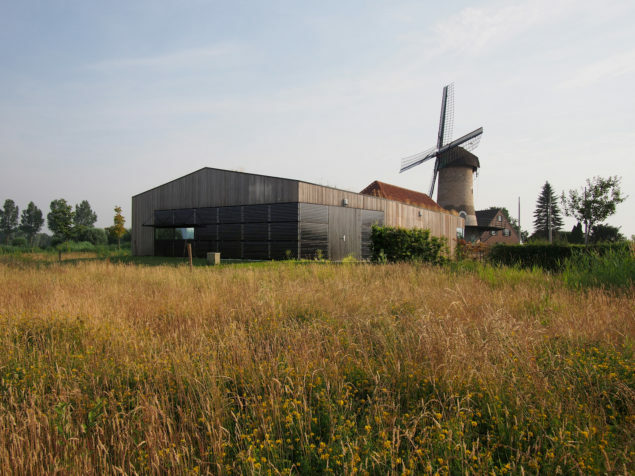 As a result of this, the Kilsdonk Mill Foundation was awarded the Culture Award of the Province of Noord-Brabant. The 'Kilsdonk Mill' comprises three buildings: two listed buildings, the windmill and the watermill, and a new visitors centre. All three are situated on a creek of the river Aa. 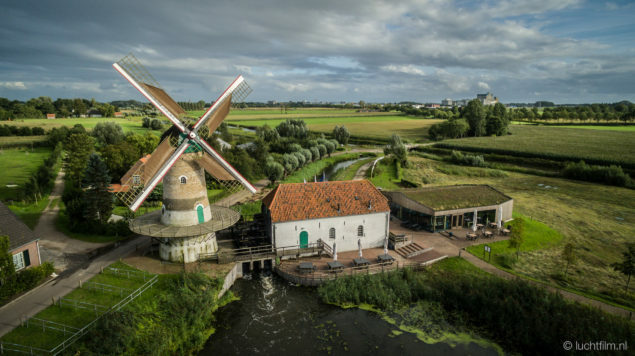 They are linked up to an intricate network of hiking and bicycle paths in a scenic area dominated by water. 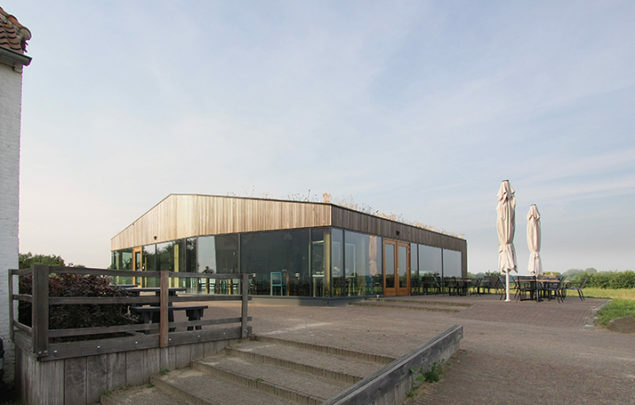 The views, directions and contours around the buildings were crucial to their eventual shape, and help embed the visitors centre respectfully in the landscape. 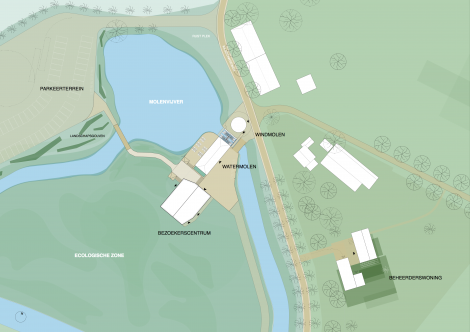 The materials used are directly related to the area or the traditional crafts exercised here. The oak wood framework and the concrete floor refer to the old wooden machinery and the millstones. 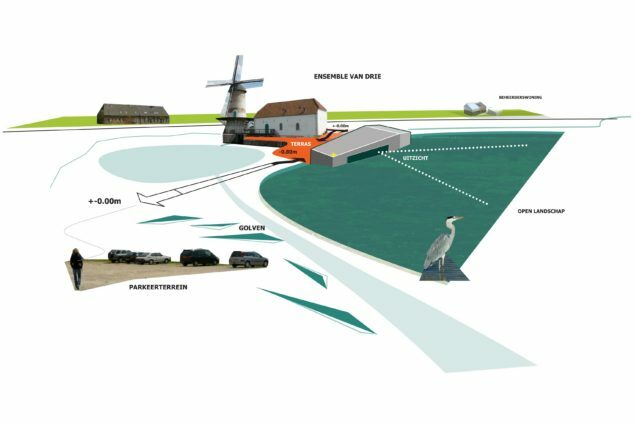 In the same way as mills used wind and water to generate power, the visitors centre uses solar and thermal energy to generate electricity. The solar panels have been integrated in the building's exterior. 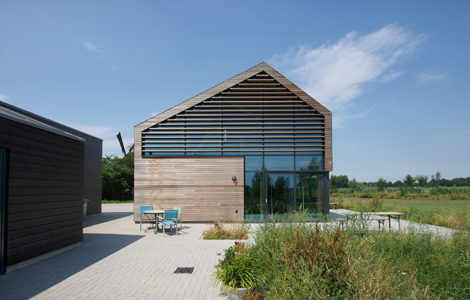 The grass roof slows down the hydrology and integrates the building in its surroundings. Its plan is a rectangle with three bevelled corners. 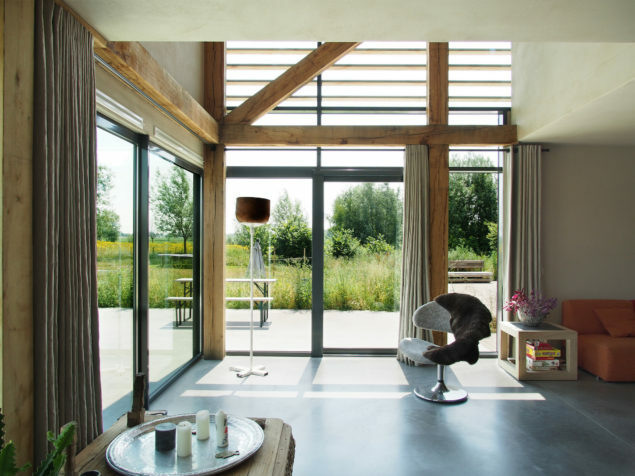 Together with the angled roof, this results in a robust but elegant look. The facade consists of alternatively oak wood elements and large glass areas, providing a maximal view of the surrounding landscape. 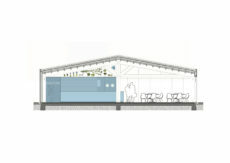 The visitors centre can be used multi-functionally, through its clever link-up of the conference room, kitchen, storage area and terrace. The interior has been set up to present information for the excursions that start from here. 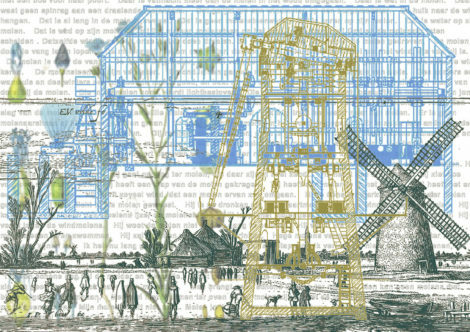 Wall-size prints have been applied to explain how the two mills work. The plan for the miller's residence consists of two buildings: a dwelling house and an annex with a workshop and a studio. Because of their relative position, the two structures are defined publicly and privately. The family's wish was to live in tune with the sun: to wake up in the east, have a view to the garden in the south and sit on the terrace in the evening sun, in the west. Furthermore, it was important for them to be able to go about their business individually within one large space: cooking, dining, watching tv, reading, doing homework, gaming, sowing, painting etc. 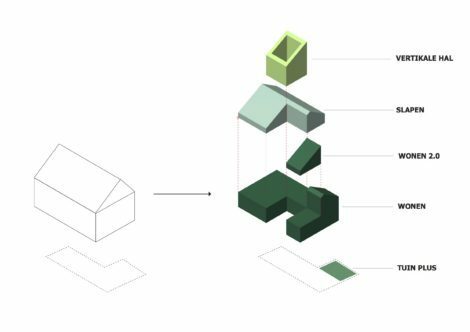 By diagonally spacing the areas and installing large sliding doors between rooms and through the void/atrium, sufficient area has been created where one can be by one's self and yet not alone. The structure is all-around, visible from many points of view in the landscape. Hence, every facade is important. 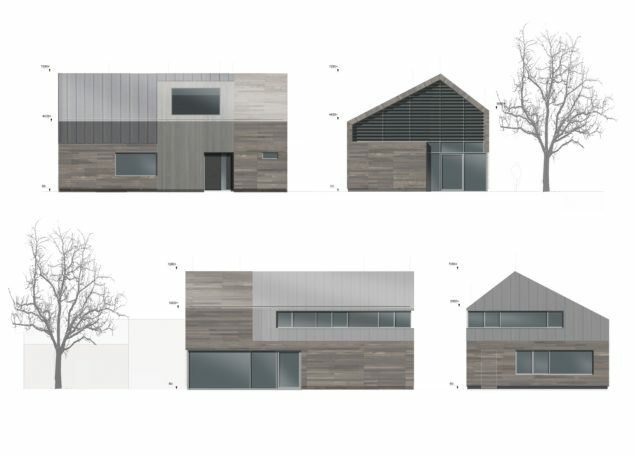 The annex has been lined with matte-black wooden panels, a reference to the characteristic farm sheds of the area. The dwelling is CO2-neutral, thanks to the use of geothermal energy, a solar boiler on its roof and solar panels on the roof of the annex. The durable solutions have been integrated unobtrusively in the design. 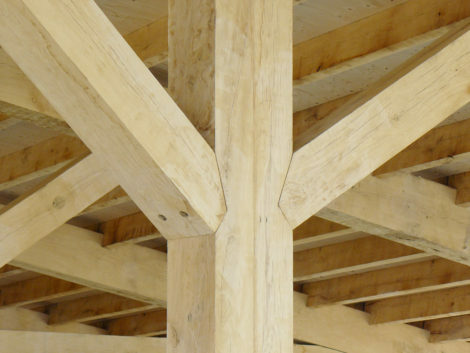 The oak framework rafter connects the first floor to the ground floor, emphasizing the available height of the void space. 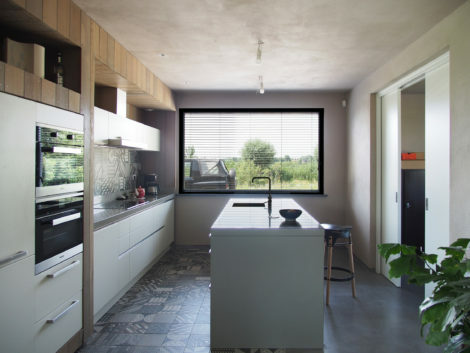 The dwelling consists of three sections: sleeping, living and a connecting hub between the two. The facade reflects these residential functions through the use of different materials: glass and wood elements – used in two ways – for the hub and the living area, and aluminium for the sleeping section.